The grapes stemming from the oldest vines in the estate (fifty years old vines), are harvested by hand, without any sulfur, under the press. Wines make a prolonged breeding of 14 months on their dregs of wine making. 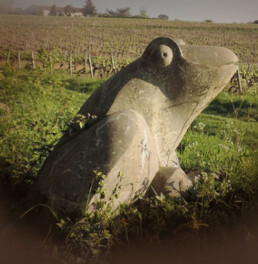 The grapes stemming from the oldest vines in the estate (fifty years old vines), are harvested by hand, without any sulfur, under the press; the free run of the juice is carried out by gravity and under an inert gas environment, in the traditional glass-tile buried tanks, which are typical of the Nantes region. A twelve-hour rapid settling allows me to keep natural nutrients and yeasts, essential for alcoholic fermentation. A twenty-day fermentation combined with a control of the temperatures makes it possible to render the best expression of the terroir. Throughout the winter, regular lees stirring optimizes the contact with the lees. As is the tradition, I don’t carry out any malolactic fermentation. 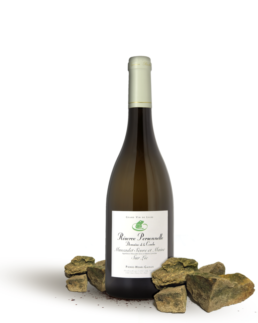 La Réserve Personnelle is bottled in December of the year following its harvest, i.e. globally after fourteen-month aging on the winemaking lees in buried tanks. The outcome is a rich, concentrated and complex wine, which is well suited for cellar-keeping. In the best vintages, this cuvee can be kept for fifteen years under good conditions. It will be best served at the table with a grilled fish or roasted scallops.